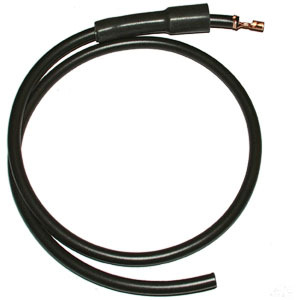 High tension lead for single and dual output digital ignition coils (IC11 and IC12). Supplied with pre-fitted brass ht crimp connector and rubber ht cover. As supplied with the complete Smart Fire ignition systems. Two leads required for dual output type (IC12). Plug cap not included (available separately). Black hypalon double insulated 7mm copper cored high tension lead. Pre-fitted brass ht crimp connector and black rubber ht cover, to suit PVL and Gill digital ignition coils.